The parents of a teenager who died after he was injured at school have spoken of how their grief has been eased by a decision to donate his organs - and that "his heart still beats on". 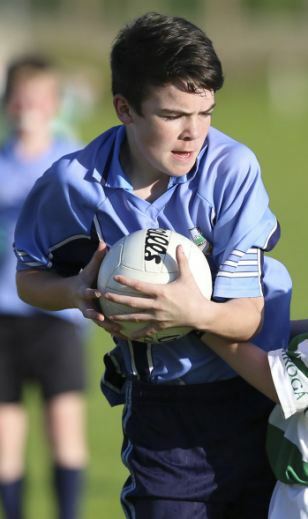 Oisin McGrath (13) died after sustaining serious head injuries in February during an incident after playing a game of football at St Michael's College in Enniskillen. He was rushed to the Royal Victoria Hospital in Belfast but died three days later. His parents Sharon and Nigel from Belcoo, Co Fermanagh, made the brave decision to donate the organs of their son - who was a talented and keen sportsman - to save the lives of five other people. They have now set up Oisin's Foundation "to keep his spirit alive" through raising awareness of organ donation. They also aim to raise funds for brain injury research and to help develop sporting initiatives for young people. Sharon (42) described the death of her son as "devastating" but said her family hoped Oisin's story would inspire others to support organ donation. "We get some comfort knowing that his heart still beats on and that something positive has come out of this," she told the Belfast Telegraph. "It was the right thing to do, we feel, knowing Oisin's generosity of spirit that he would have wanted us to do it." Sharon, a technical services manager for South West College, said: "We hope it will encourage everyone to talk about it as a family so that each is clear how other family members feel about it. There are so many people who will die without transplants, we want to work to try to prevent other families having to suffer the loss of loved ones." Sharon said it was "a difficult decision" to donate Oisin's organs. "It was something that we probably knew we would do even from when it was first discussed. It was a devastating time for us and we were initially reluctant to even speak to the specialist nurse for organ donation, but looking back that was more about not wanting to believe what had happened and also because we were still fighting for our son, praying and willing him to pull through. If Oisin's life could have been saved by someone else's organs we would have grabbed that opportunity, so how could we not allow Oisin to give this gift to others? Oisin gave the gift of life to five people." A 17-year-old boy had been interviewed in relation to the incident and was later released pending a report to the Public Prosecution Service. Meanwhile, this Sunday a special GAA match will take place in memory of Oisin with donations going towards the new foundation. The match between Fermanagh and Sligo's senior football teams will take place at 6.30pm at Brewster Park in Enniskillen. The family have also received a message from the Fermanagh GAA manager Pete McGrath, who spoke of being moved by the look of determination in a photograph of Oisin playing football and how others can be inspired by it. "The intent and single-mindedness clearly emanating from his facial expression can be a lesson and inspiration to us all not only in terms of what is needed to succeed in football, but also as regards what is needed to fulfil our potential in life - energy, enthusiasm, determination and a genuine love for whatever we channel our God-given talents towards," Mr McGrath wrote. "I hope that all of Fermanagh's young footballers can draw inspiration from Oisin's short but marvellously full life - and from this iconic photograph." This page was loaded Apr 22nd 2019, 10:35 pm GMT.